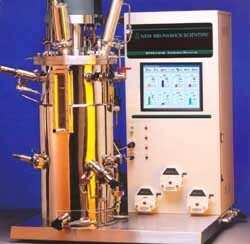 The BioFlo 4500 is an industrial fermentor/bioreactor with the power, versatility and advanced controls for microbial, insect and mammalian cell culture,in applications ranging from research through small-scale production. A wide array of options enable configuration to your individual process requirements, without the high cost and delays normally associated with purchasing a custom fermentor. The system’s most powerful feature is its advanced control capability, driven by NBS ML-6100™ multi-loop controller with touch-screen interface. With the ML-6100, on-screen entry of process control loops, sterilization cycles and calibration routines is remarkably intuitive, making the BioFlo 4500 exceptionally easy to operate. Almost any auxiliary process device, from sensors to biochemical analyzers, can be integrated with the fermentor without need for additional hardware, software or a service technician. In fact, every facet of this compact system has been designed with efficiency in mind. An open-frame design provides easy access to all piping, valves, regulators and filters; and assignable, peristaltic pumps with Easy-Load® pump heads speed tube loading. The system is fully cGMP compliant. For process flexibility and operating simplicity the BioFlo 4500 has no equal. I see a steam/water leak from the vessel top mechanical seal that lets the impeller shaft through. Can you help me fix it? There are no threads in New Brunswick Scientific BioFlo 4500 Reviews at this time.